Former 140 pound champion Amir Khan is in the news quite a bit today: from his comments regarding how Canelo Alvarez should have been handed a far stiffer penalty for his two failed drugs tests (see article below), to the admiration he has for, and the inspiration he has received from Anthony Joshua, to his making weight for tomorrow’s must-win fight with Phil Lo Greco. Khan remains a name, no doubt – but can he still fight as effectively, as courageously and as entertainingly as he once did? There was a time when “King Khan” really was one of the most explosive, consistently entertaining upper-echelon warriors of the lower weight divisions. Proof of this came in a simply astonishing fight back in late 2010, when Khan, scoring by far the biggest, most impressive victory of his entire career, amateur or pro, overcame the lethal fists and rock-hard resolve of Marcos Maidana. Khan, shoving the critics’ “chinny” claims firmly down their throats, took the Argentine slugger’s bombs and, quite shockingly, he never went down during the 12 hellish rounds. Maidana, however, cannot make such a claim; the now-retired (and quite fat) “El Chino” having gone down hard in the very first-round from a sickening body shot he did incredibly well to recover from. The fight, staged at The Mandalay Bay in Las Vegas, had “everything,” so says the man who as the third man in the ring that night – Joe Cortez. Speaking with ESPN Deportes recently, Cortez – who worked so many great fights featuring so many great fighters – said he ranks the epic 140 pound rumble amongst the Top-20 best fights he ever worked. That’s quite an honour for the fight – but, as anyone who has seen it knows, it sure deserves it. It had those ingredients indeed, and how special might a rematch between the two have been! Maidana, who lost by a slim margin on all three cards (Cortez says today how the scoring of the fight was “right on the spot”) claimed he was robbed and always wanted a second go at Khan; a man who had taken his best shots, in a torrid tenth session especially. Could Khan have repeated his big win of over seven years ago? 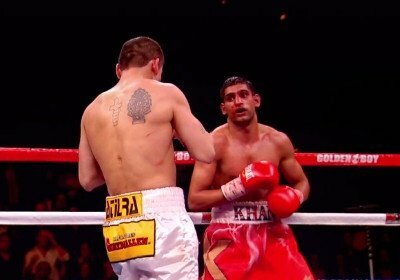 Who knows, but if Khan, now aged 30 and closing in on retirement, can still fight like he did that special night in Vegas, fans will embrace him all over again. As for Cortez – I wonder which fight he ranks as THE greatest he ever worked! ?